Ore.e Refineries advocating sustainable design. 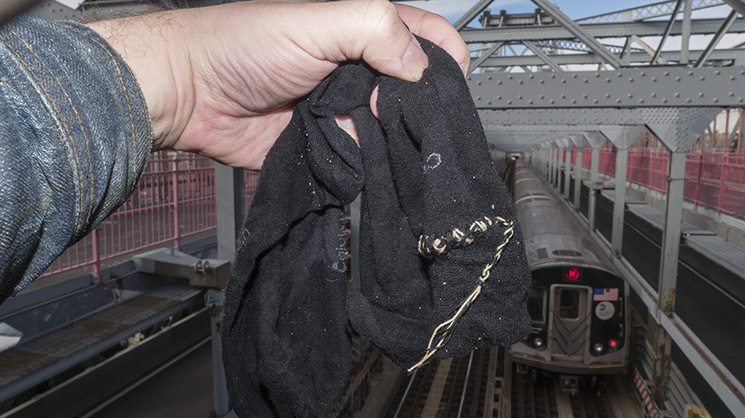 Send your broken socks to be repaired in New York City. 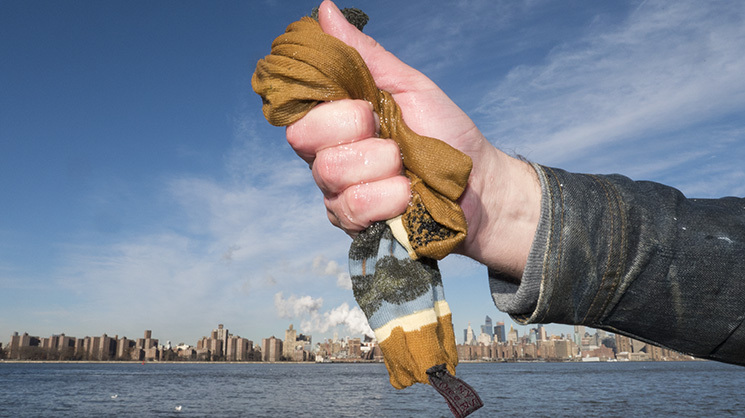 After your socks are fixed, they will be washed in the East River, photographed against the Manhattan skyline and returned back to you. Fixed and clean! Repairs will be made by hand, using recycled materials. You can also have your socks exchanged to socks of our other customers! It doesn't matter how broken your socks are, we are here to help. 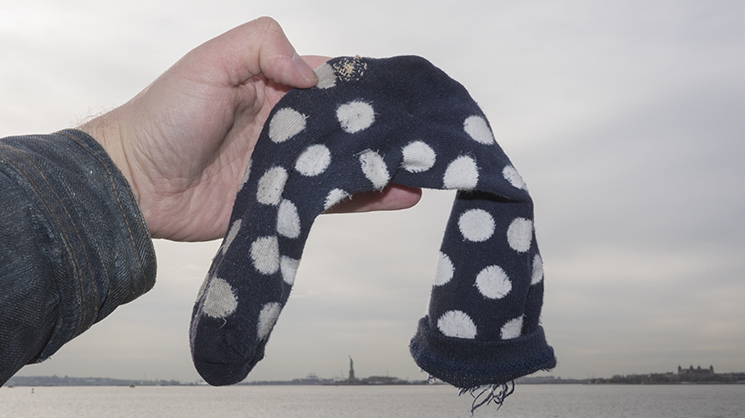 The New York Sock Repair & Exchange service is a perfect gift for a fashionable friend. 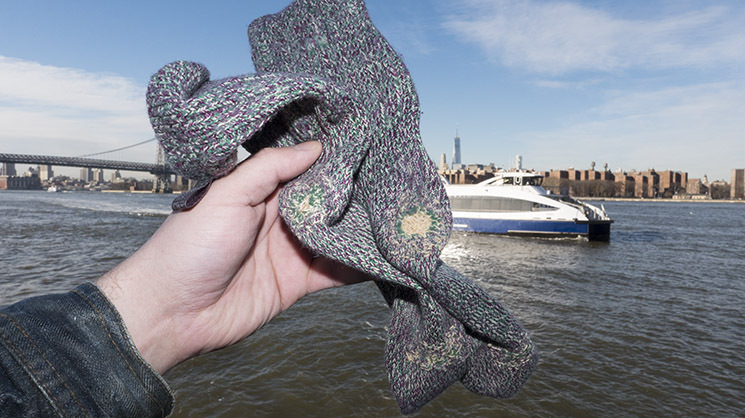 The text NYSRE18 (New York Sock Repair & Exchange) will be embroidered on the repaired socks to commemorate the repair. You can follow the the repair status of your socks online. The service pilot is operational between August-December 2018. 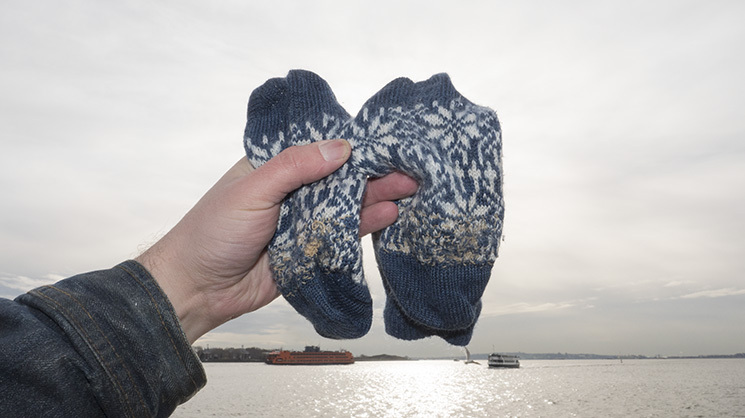 Send your broken socks NOW to have them repaired in time for the Holidays. During the service pilot (Q3-Q4, Summer-Fall of 2018) the service is free! The socks you send must fit a standard letter. 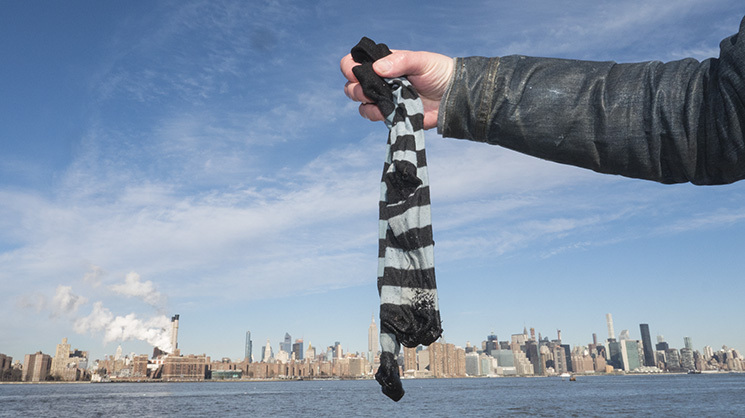 Please let us know if you want your socks photographed next to different landmark in New York City. 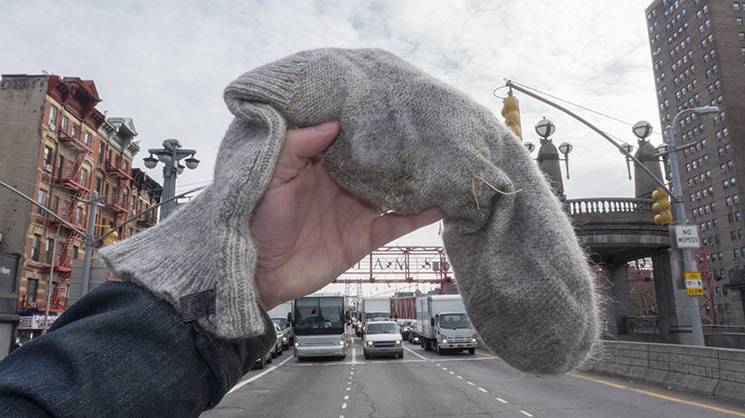 *2018-12-07 important update: Thank you for participating in the successful New York Sock Repair & Exchange pilot. 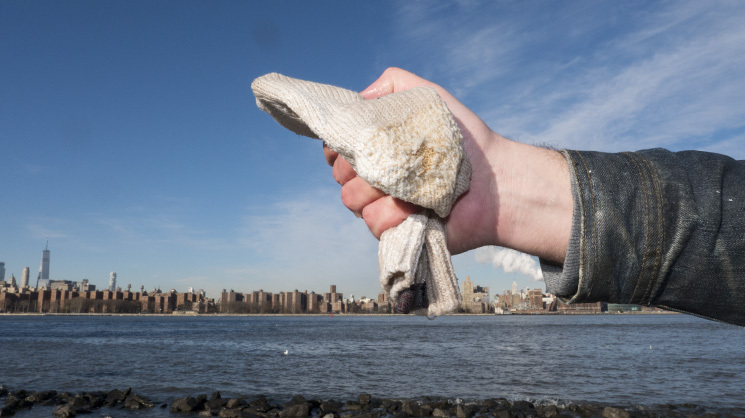 All of the socks were repaired, washed in the East River, photographed against the Manhattan skyline (or next to a landmark of the sock-owners preference) and are being returned to their owners. 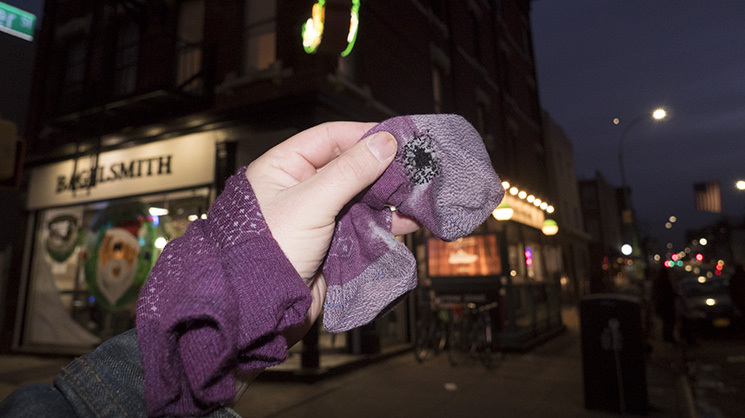 Photos of the repaired socks are available below. If you missed this opportunity to get socks repaired, please feel free to be in contact and we'll work something out. Let's start a sock repair pool or something? 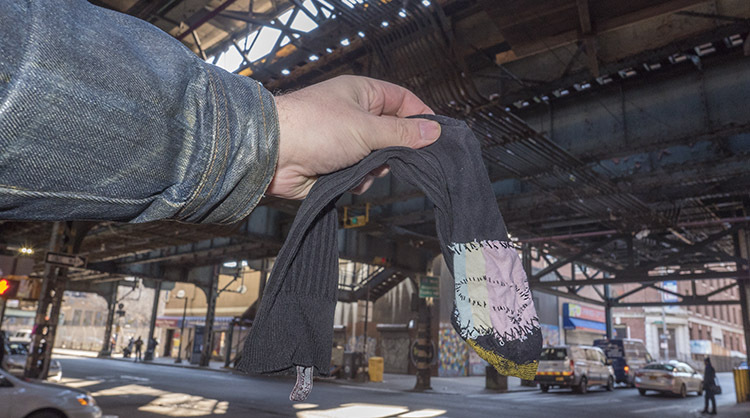 Do you want to have your repaired socks photographed next to a different landmark in NYC? Please follow to this link for all sock repair photos (close-up of stitches etc.). Links below images open high-resolution photos. As a sock owner you have to right to use all of the images according to the COOL1 license. 2018-12-17 Finalising the process. Feeling content. 2018-12-07 One more pair of socks to shoot. 2018-12-04 All the socks are repaired. Tomorrow I'll shoot them on location. 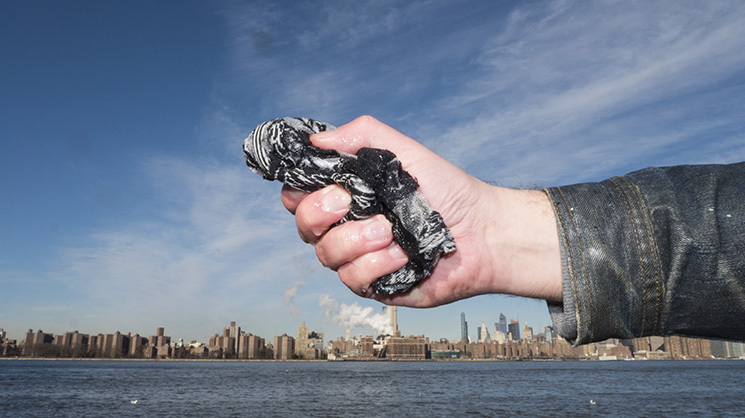 The plan: Grand Ferry Park (Wash socks. Photo all socks together). 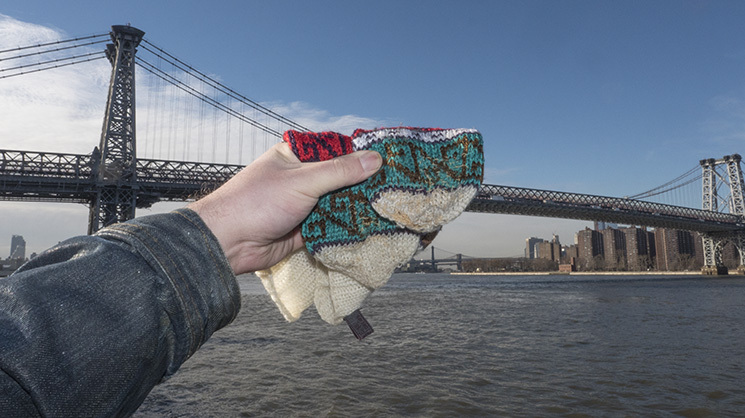 Walk across the Williamsburg bridge (shoot some individual socks). To Essex St. -> Take M to 5 Av. / 53 St.) Shoot a pair at Trump Tower. To 5 Av. / 53 St -> Take M or E to West to 4 St-Washington Sq. St. Shoot a pair at Stone Wall In. One pair at a Bagel Shop? To Christopher St Station -> Take 1 to Rector St. 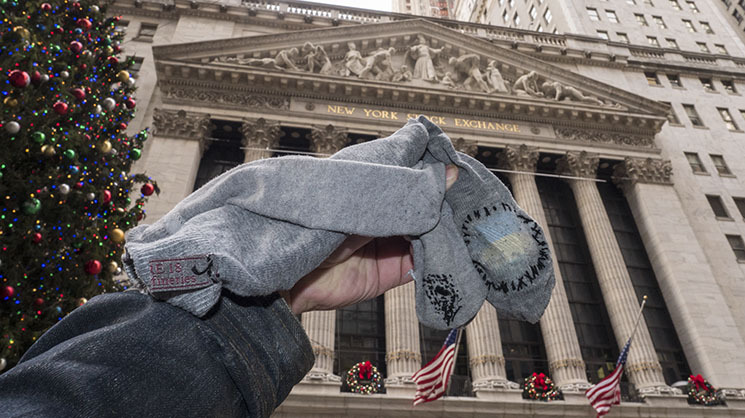 Shoot a pair at the Charging Bull and Wall Street. Walk to Battery Park to shoot a pair. To Bowling Green Station -> Take 4 or 5 to Borough Hall (and walk to bridge). 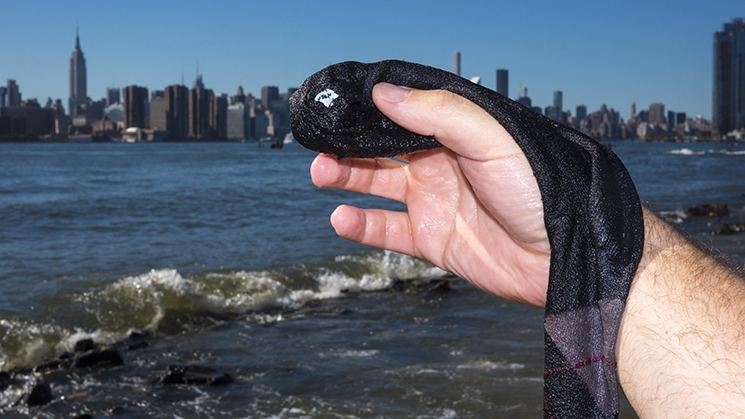 Shoot a pair at the Brooklyn Bridge. 2018-11-16 There are now 27 socks on my wall (some pairs), which I've successfully darned. Some socks (the woollen ones) took me over two hours to complete. I restored them using thick visible stitching's, so that people will have with a good story to remember. Some of the stitches look like ornaments. 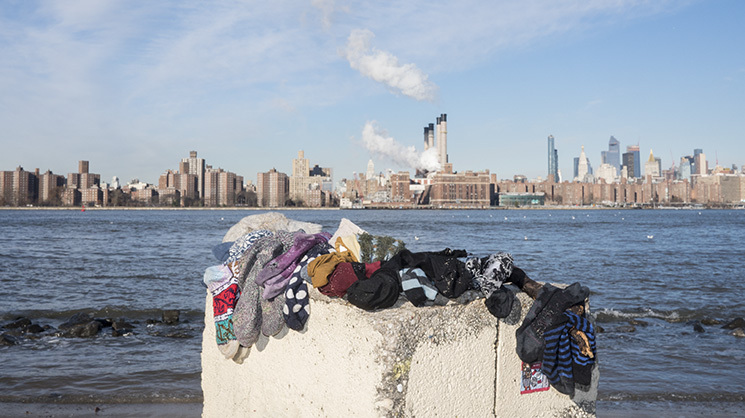 I suspect it'll take me one day to document the socks in my studio and a day to wash them in the East River and to photograph as promised. Feeling good. While fixing the last pairs I was listening to Why We Bleep Podcast 004: Transistor Sounds Labs (2018) mylar melodies. In the podcast Nina Richards and Zoe Blade give a nice introduction to their design process and talk about sexism of the electronic/computer cultures. 2018-11-13 Good stuff to listen to when fixing the socks of strangers around the world (only 5 pairs to go). We had an open studio event on the weekend at ISCP. I was in a flue for the entire event and sat in the corner darning socks. A hipster complemented my stitch-work and told me I’d make 300$ for a pair! 2018-11-01 I won the ISCP Halloween costume contest. Residents were tasked to dress up as famous artists or artwork. I immediately knew how to win the competition. My art education was basically 6+ years of faking to be famous artist or artwork. I dressed up as Agnes Denes. 2018-10-31 TZ got in contact and asked when they'll receive their socks (December). The return address was changed. 2018-09-01 Socks are coming trough mail and I'm attaching them on my wall like trophies. 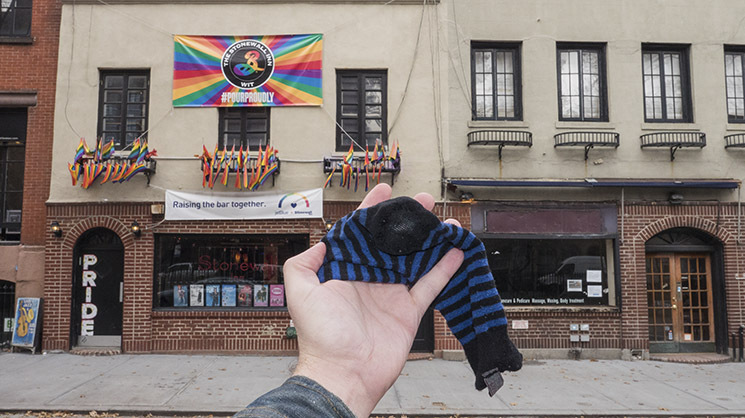 Also people from the ISCP residency and FCINY are bringing me their socks for repair. 2018-08-20 KM got in contact over mail. Confirmed that I'll take good care of their socks. 2018-07-30 Got note of a pair of socks in transit. LW socks arrived three weeks ago. When I get five socks to work with I'll start fixing. I hope people from Europe send their socks, so that we can get a trans-atlantic sock repair & exchange going. Got a novel request to photograph a pair of socks at the Trump Tower. 2018-07-08 *Yli-Vakkuri is an apprentice SockSmith mentored by MA Minttu Sipola. Photo added. Someone leaked news of the service. No biggie.